LOHAS Smoothie contains sixteen varieties of Japanese-grown cereals, which have been an integral part of the Japanese diet since antiquity. The nutritional value of the cereals’ essential amino acids, which are necessary for protein synthesis, is enhanced by first fermenting the cereals using malted rice, then roasted them. 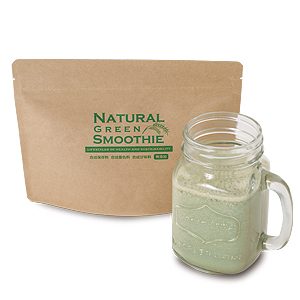 The smoothie is packed with organic barley grass powder, a strong antioxidant, and is abundant in sasa veitchi-boosted dietary fiber, which intestinal bacteria feed on. The crunchy super foods, chia seeds and quinoa, sustain modern, mineral-deficient dietary styles. This drink ensures you get much-talked about nutrients, such as anti-aging gamma-aminobutyric acids, total ferulic acid that prevents forgetfulness and oxidization, and gamma-oryzanol that maintains the body’s balance.